Over the past few months, as I've been taking a look back at the ARIA charts from 1987 and 1988, I've stumbled across a handful of songs that would otherwise have remained lost to me. Singles that I'd forgotten even existed (like last week's new entry by Eurythmics) as well as songs I never heard much of at the time (like Geisha's "Calling Your Name" and The Silencers' "Painted Moon"), which have all now been added to my iTunes library. This week, we have plenty more obscure songs to remember (some of which are particular favourites of mine) before we get into the new entries. Speaking of the top 50 debuts, it was a stellar week for new songs, with all four going on to reach the top 10. 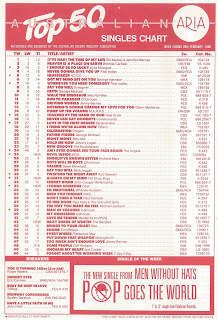 Meanwhile, "(I've Had) The Time Of My Life" held on to the number 1 position for a fourth straight week, but Kylie Minogue's "I Should Be So Lucky" was closing in, jumping from 10 to 3. 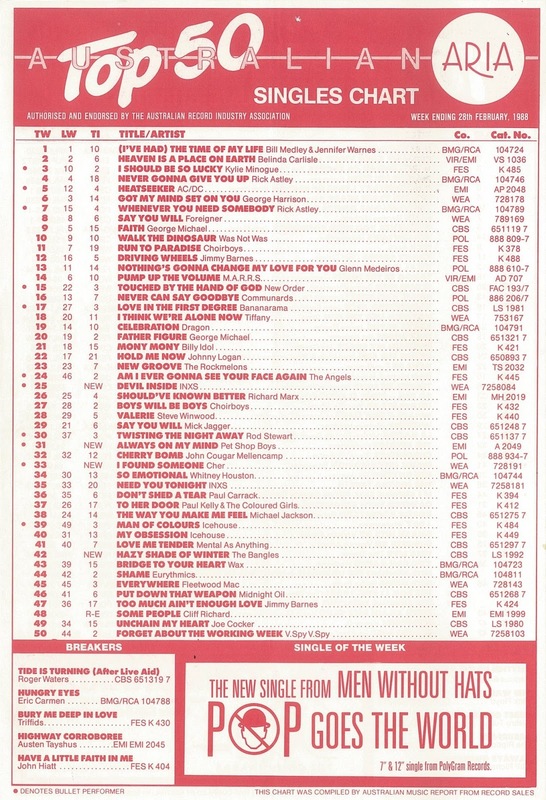 "Unchain My Heart" was just about to drop out of the top 50, but this follow-up co-written by Dan "I Can Dream About You" Hartman had a surprisingly low peak. Seems not many people wanted The Style Council anymore, with this between-albums single giving them a final, fleeting top 100 appearance on the ARIA chart. The much-covered song would do well for U2 the following year, but this version by the future voice of Enigma from her first greatest hits album didn't repeat its European success here. Not to be confused with The Everly Brothers, this Australian folk/country duo was comprised of Terry Bradford and Greg Williams, and would later change their name to The Everys. Four-and-a-half years is a long time in pop music - and in February 1988, it had been that long since Men Without Hats had taught the world how to do "The Safety Dance" (a number 5 hit in Australia). Returning with what would become their second best known song, which I've always thought sounds like it was recorded on a kids' Casio keyboard, the Canadian synthpop band found a reasonably receptive audience in the US and some parts of Europe, but not in Australia. In the late '80s, there always seemed to be some husky-voiced male singer or other on the scene. From Joe Cocker to Chris Rea to this guy, who never really made a massive impact on the chart but is one of those artists other performers cite as a huge influence on them. Even Mandy Moore, who remade this song for her Coverage album. "Have A Little Faith In Me" fell short of the top 60 in Australia, but it's one of those songs that has hung around on the periphery ever since - popping up in films and on classic radio stations. The previous couple of years had been kind to Susanna, Vicki, Debbi and Michael - thanks to "Walk Like An Egyptian" and "Manic Monday", the girl band was one of the biggest acts in the world. The group's members, however, were not being so kind to each other, with in-fighting and jealousy rife as a result of Susannah being portrayed by the media as The Bangles' lead singer. This cover of the Simon & Garfunkel 1966 song was recorded for the soundtrack to Less Than Zero and stormed into the top 10 in Australia. I realised just now that I'd never actually heard the original and so I fired it up on YouTube. The Bangles version has a much harder edge and thankfully lacks the "Oh, Pretty Woman"-style bass line. This future top 10 hit featured in my list of favourite songs from 1987 (as usual, Australia was a bit slow on the uptake) and I wrote about it quite thoroughly when I counted down my top 100 for 1987. 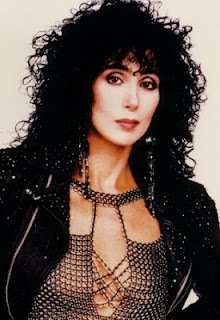 What I didn't mention at the time was that it was Cher's only hit from her self-titled comeback album, with follow-up single "We All Sleep Alone" (co-written and co-produced by Jon Bon Jovi and Richie Sambora) not hitting the top 50 locally. Another single lifted from Cher was the radical new version of her 1966 hit, "Bang Bang (My Baby Shot Me Down)". The new "Bang-Bang" (as it was renamed) also flopped in Australia. Just missing out on being my favourite PSB single of all time - that title belongs to "It's A Sin" - this new version of the Elvis Presley classic was the UK Christmas number 1 for 1987 and would find its way to number 10 in Australia. Although the pop duo hadn't quite finished releasing singles from their Actually album - "Heart" would come later in 1988 - "Always On My Mind" wasn't added to that LP's tracklisting. These days, a "deluxe" edition would be rushed out. In fact, the song wouldn't appear in its 7" form on a PSB album until 1991's greatest hits collection, Discography. Since I didn't buy the single at the time, it was a long wait for me to finally own it. INXS were really on a roll at this point, with this second single from Kick beating its Australian chart peak by getting to number 2 in the US. So big had they become in the States that the clip was even directed by in-demand St Elmo's Fire and The Lost Boys director Joel Schumacher. "Devil Inside" is actually my least favourite of the Kick singles (my favourite, "Mystify", wasn't even released in Australia) but there was no doubt it was the sound of a band at the top of their game. Next week: another hit from Dirty Dancing, plus the arrival of new solo hits from lead singers of two well-known '80s bands. I remember the Joe Cocker song well, but hadn't realised it flopped this badly before. I remember seeing a Sandra single in the shops in the early 90s, but never actually heard any of her non-Enigma music until the mid 00s. I liked a couple of her 80s/90s singles enough to have bought a DVD collection. 'In the Heat of the Night' from 1985 is a favourite. 'Everlasting Love' is a boring song to cover, but her version is decent. I assume that we got the PWL version. I didn't hear 'Pop Goes the World' until it appeared on the Pump It Up '88 compilation. It's not quite as 'good' as 'The Safety Dance'. I too thought it sounded like it was recorded on a small keyboard you could buy in the likes of K-Mart. I remember hearing 'Hazy Shade of Winter' on the radio as a new release and grabbing a blank cassette to record it. I thought it sounded very 60s/'Beatles'-esque. I recently heard Strawpeople's version of 'Have a Little Faith in Me' on Spotify and thought it sounded familiar, but couldn't place it. A bit overplayed since, perhaps, but 'Always on My Mind' was a classic. The 'Devil Inside' video does look very 'American', and subsequently, INXS look a bit out of place in it. To me, they look like tourists who ended up on the video set of their own song. Yeah, the Joe Cocker song was really familiar to me as well. Maybe it got a lot of airplay. I bought the 12" single of "Everlasting Love". Well, I thought I was buying the 7" single, but the record store that ordered it for me (they didn't have it in stock) got the 12" instead and I only took it because it had the 7" version tucked away from the B-side. Anyway, that had the European mix on it, which I've linked to, and not the PWL mix. Assume our 7" single also had the European mix, but who knows.